Free Download McAfee Internet Security Full Version With 6 Month Serial License Key – McAfee Internet Security is an award-winning PC protection suit that provides comprehensive, real-time protection to keep your PC safe from viruses, Trojans, spyware, and malware it might pick up from email, USB sticks, removable hard drives, or simply browsing online. 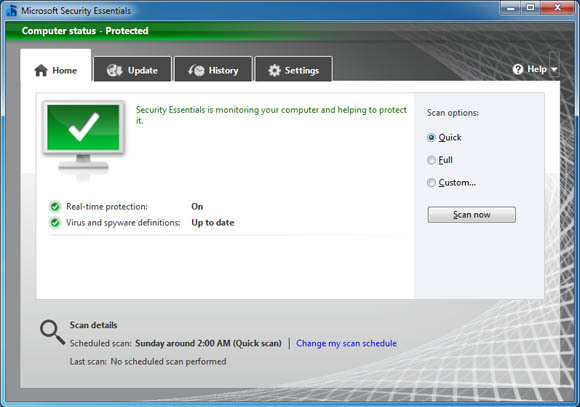 The program offers antivirus, anti-spyware, anti-bot and two-way firewall protection. 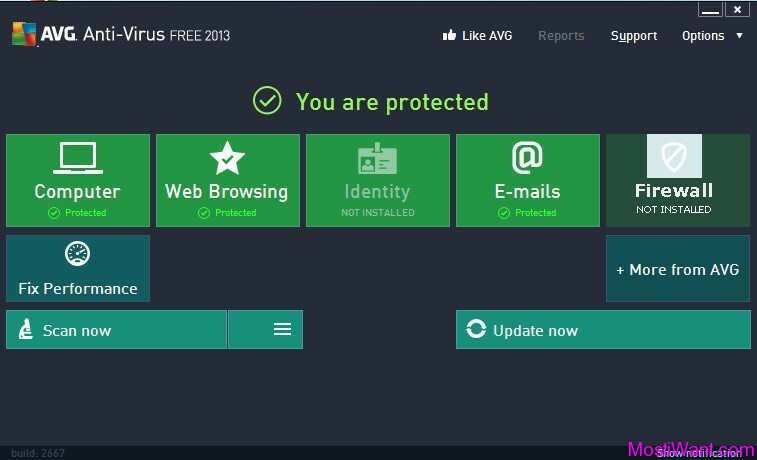 Additionally, it includes anti-spam, parental controls, easy-to-use McAfee WebAdvisor – an online safety guide that warns you about risky web sites before you visit, and a few PC utilities, including the QuickClean tool, defragmenter and file shredder. With thousands of new viruses created every day, relying on traditional security updates isn’t enough anymore. That’s why Mcafee added Active Protection technology. This exclusive feature instantly analyzes and blocks new and emerging threats in milliseconds so there’s no gap in your protection. 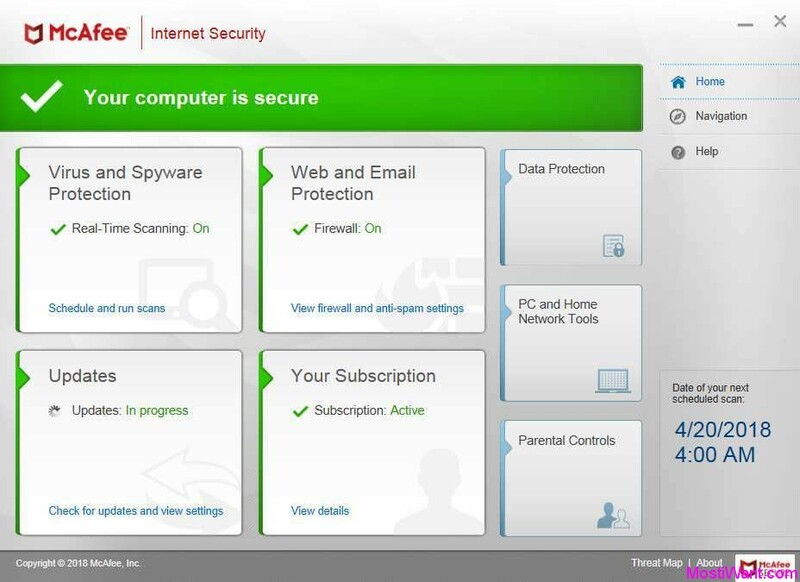 McAfee Internet Security is designed to be a “set-it-and-forget-it” solution for computer security and it fills that role quite capably with an improved user interface. With McAfee security software working in real time, security is there when you need it, invisible when you don’t. Those looking for a complete protection in a simple, user-friendly interface may find this product with its antivirus, firewall, and tune-up components fills the bill. Complete Anti-virus, Anti-spyware, and Anti-malware. Relentless security software scans and blocks dangerous emails, risky web content, and online threats like viruses, Trojans, spyware, and rootkits. Two-way Firewall. Extra layers of Internet security software block bad guys breaking in or sneaking out with your personal information. This traffic cop patrols nonstop to prevent malicious software from gaining access to your PC. Safe Searching and Shopping. Color-coded icons next to your search results let you know before you click which sites are safe and which may install malicious code, phish for your identity, or send you spam. Surfing Report. When you need to know what is happening online, this report shows login times, attempts to access forbidden sites, and total online time. You can also see who is online when. Facebook Promo ( 6 months Free Subscription) – Still working! McAfee Internet Security is normally priced at $69.99 for a 1-PC 1-Year Subscription, and come with a 30 days trial like other security software. Now you can download McAfee Internet Security full version with 6 months subscription for FREE thanks to a promo my Mcafee and Facebook. In fact, this is a part of the promotional offer led by Facebook following the launch of the Facebook Antivirus Marketplace. However, this is an easier way to get McAfee Internet Security Free for 6 months as you can directly download and install the program without going through any of the steps at Facebook site. 1. Go to this giveaway page, create an account (this offer is for new users only, so it’s better to create a new Mcafee account ), and then complete your order (Promo code is not needed). 2. 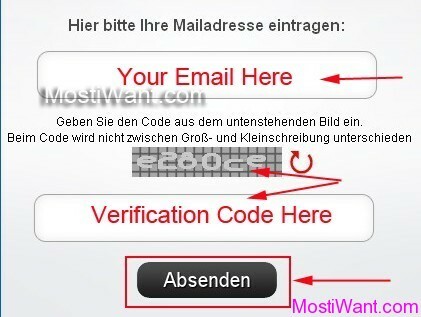 Once you have completed the order, hit the GET My Trial or Go to My Account button to go to your Mcafee account. 3. 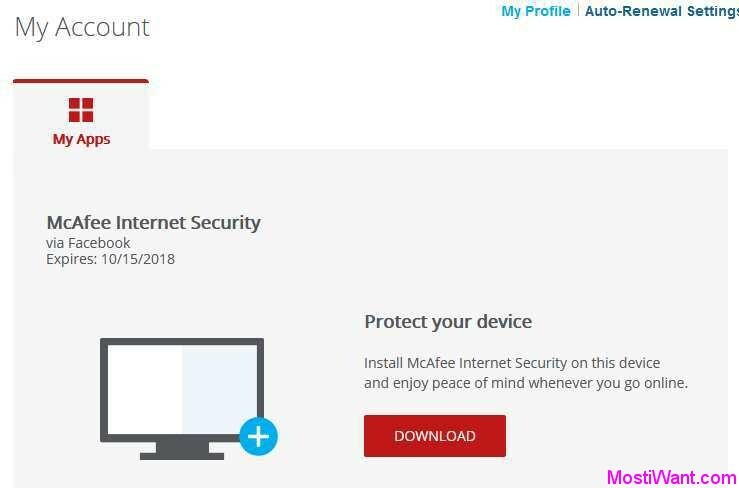 At your Mcafee account, you will see that you have Free 6 Months Subscription of McAfee Internet Security 2018. 4. Now press the DOWNLOAD button and you will be given your serial number at the next screen. Then download and install McAfee Internet Security 2018 and activate it with your serial number. Enjoy your complimentary 6-month full version McAfee Internet Security 2018. As a Commonwealth Bank online banking customer, you are eligible for an exclusive 6 Months free subscription of McAfee Internet Security ( 3 User for PC & Mac). In order to take advantage of this offer, visit this promo page and follow the instructions on screen. Note that you will need to provide your billing information for future automatic renewals! If you do not want to pay for this software, be sure to cancel auto-renew before the end of free subscription. Here over to this page to turn off the automatic renewal feature. Alternatively, the Facebook promo (free 6 months subscription) above does not require any payment info. Thanks to naveen for informing me about the alternative offer. We rely readers like you to keep us alive! Update: The old promo shared on (Oct 19, 2012) is still working for version 2018. I change the date published for this post to make it up. Hope you will enjoy this 6 Months Full Version free offer of McAfee Internet Security 2018. Hi Danny, sorry but there is no giveaway available for both software currently. just seen it have deleted all my keygens and patches to the second time before Norton was erasing it. There was no trojans in them. It will takes me weeks if not months to find all the cracks again. Hi GorbonBlue, I am so sorry to hear this. Since software crack is not a legal process, some antivirus software like Mcafee will always delete such cracks. You may try to find those cracks in McAfee Quarantine folder.And then, if you want to continue to use those cracks, you may uninstall Mcafee. GordonBlue: If you are clever enough to find or make keygens and patches for warez, how the hell could you make such a noob mistake as not backing up your sh*t? good luck.hope u find them. After installation my computer got very slow. All is like in slow motion. What can I do? Link is almost dead and no Facebook promo at all. Hi tonmeijer, just tested and verified, offer is still available. Thanks, my friend, the offer requires Australian / New Zealand IP, ZipCode and phone number. This offer is open to Australian and New Zealand residents only. Limited to one copy per person or household. Only 1000 licences available. im never fond of web installers and always moving away from software that does way to much goes wrong with them. @Marcus, this is for windows only! For mac, you may try some freeware products like Avast! FREE Anti-Virus 7 For Mac OS X, Avira Free Antivirus for Mac OS X, and Norton iAntivirus For Mac OS X.
if the soft is good then i will buy it. still working. Mcaffe is great, this site its wonderful. I dare to disagree, noname. Most objective review sites appear to give McAfee more points than, for example, the crappy and bloated Norton. McAfee usually makes it to the Top 3 list. I guess you work for Norton or one of those substandard AV companies, eh? Anyway, has anyone tested this on a machine which had the previous trial on? I’m concerned about any hardware signature/ID but also about risks/signatures of quarantined items. I don’t want to completely erase a perfectly good program just to find out I cannot install another trial version on the same machine. First of all, Thanks for your time and all the valuable comments, suggestions, and information you have given here on my blog. I am really appreciative. Secondly, I am not working for Norton/Mcafee, nor any of the AV companies. I am just a personal blogger. Thirdly, this offer should work on a machine which had the previous trial on, but you will need to completely remove the trial version before hand. Wow, it surely did take me a “while” to reply to your November 1 comment… until you’ve republished the deal some four months later, to be exact. First of all, thanks for the tip. 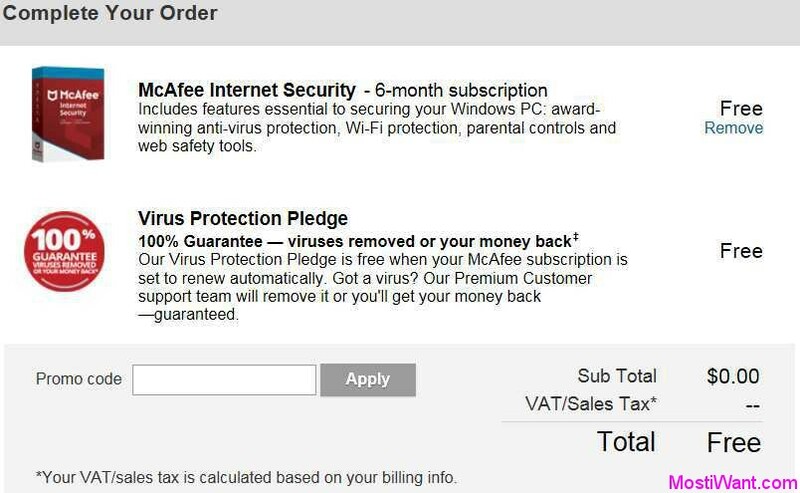 I’ll try to reinstall the deal now (with a new McAfee account/email address, of course). Okay, William, it’s time to talk about you and your Norton affiliation! EVERYONE KNOWS YOU ARE WORKING FOR THEM, EVERYONE ─ E V E R Y O N E !!! YOU ARE DEFINITELY NOT IMPARTIAL! C’MON, EVERY SECOND DEAL IS NORTON! You never EVER promote giveaways from other AV software publishers, let’s say from McAfee or PC Tools. Have we ever seen those here? Nope. Not a single time! Obviously you just LOOOOVE your employer, don’t you? Stop being so loyal to your boss and reduce the Norton deals from 50% down to a reasonable third or so. Anyway, although I’ve been quiet for a few months, I just want to assure you MIW is still on my ‘Visit Daily’ list. You’re doing a terrific job, William. Keep up the good work! Have a lovely day, Ota! Are you excellent thank you so much. Downloading always fail up to now. Strange!